The AeroPilates Pro XP 556 and 557 are top contenders for anyone considering a home Pilates machine. Designed with performance in mind, these Pilates reformers have the same features as a studio reformer, but without the commercial cost. For non-beginners looking to take their home Pilates workouts to the next level, an at-home reformer Pilates could be the answer. Pilates is an exercise program that focuses on improving core strength through a series of movements that challenge the body's balance, coordination, and flexibility. Emphasis is placed on what's referred to as the body's powerhouse. The powerhouse is made up of muscles in the abs, low back, glutes, and thighs. In Pilates, careful attention is paid to posture, body awareness, and breathing patterns to enhance the connection between the mind and the body. What Are the Benefits to Pilates Exercises? Ask anyone who's already participating in Pilates about its benefits and you'll find out for yourself just how much of a difference it can make in a person's life. For starters, Pilates trains the entire body to work as a cooperative unit. Although the body's powerhouse remains the primary focus, core strength cannot exist on its own. In order to support a strong core, you'll first need to promote balanced muscle development and full joint range of motion within the body. Likewise, greater range of motion helps elongate the muscles, which could result in a leaner and toned appearance. Longer muscles tend to suggest better muscle elasticity and joint mobility. A body that can adapt to everyday stretching and bending is less likely to become injured. Perhaps the biggest benefit of Pilates is how versatile it is. Depending on your health and injury concerns, fitness level, and other individual needs, the Pilates exercise program can be personalized so that you achieve your goals. A typical Pilates session consists of a sequence of exercises that are arranged to be performed in a specific order. These movements require deep concentration to ensure that they are executed with proper technique. The good thing for beginners is that Pilates mostly uses your own body weight as resistance. As well, many exercises are performed in a seated or reclined posture, which makes Pilates relatively low impact and easy on your joints. For more advanced athletes, Pilates can be made more difficult by adding resistance, incorporating full-body weight bearing, and utilizing exercise modifications to increase intensity. What Is a Pilates Reformer? The reformer was invented by the founder of Pilates, Joseph Pilates, with the intention of further developing his fitness program with the help of an apparatus. The machine is meant to augment the effectiveness of the exercises by creating just enough resistance to challenge the body without going overboard. By engaging with the reformer, the user is given precise guidelines to follow, which can help promote good body alignment and reduce the risk of injury. 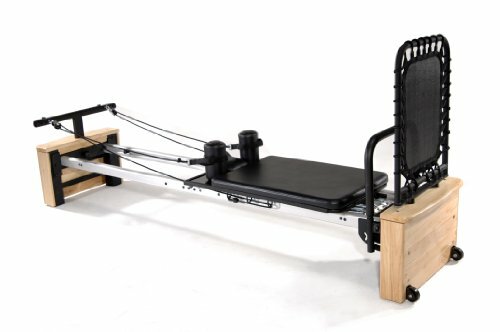 The carriage is the flat, bed-like surface on the reformer. In fact, the modern design of the carriage gets some of its inspiration from Joseph Pilates' earlier iterations when he rigged up hospital beds with springs to make the reformer. The carriage is where you'll most likely be positioned, either sitting, kneeling, standing, or lying down on the bed's surface. It is placed on a set of wheels to enable it to glide back and forth within the frame. The springs are attached to one end of the carriage. These sets of springs provide dynamic variable resistance. Each spring can be hooked or unhooked to control the amount of resistance applied for each exercise, in addition to one's own body weight. The neat thing about these springs is that depending on how you are positioned on the carriage, the resistance can come from any direction, allowing you to strengthen your muscles from all sides. The gear system gives you another way to adjust the total resistance exerted by the reformer by changing the distance between the end of the carriage and the springs. This adjustment is also handy if multiple people will be sharing the same reformer, as the gear system can be used to accommodate people of different heights. Taller folks will need to start further away from the springs than a shorter person. The footbar is located on the same end of the carriage as the springs. It is used to provide stability to the user while the carriage is in motion. Although it's named the footbar, the bar can be used with your hands or feet to help push or pull the carriage. Most reformers come equipped with an adjustable footbar to adapt to different exercises. The headrest offers head and neck support for when you're performing exercises while lying on your back. It should be adjustable to accommodate different head and neck postures. Most headrests can lie flat or be tilted upward, depending on the movement required. The shoulder blocks are positioned at either side of the headrest and are used to provide support for your shoulders as you push or pull the carriage. Depending on the exercise, the shoulder blocks can also act as footholds. The ropes add variety to a Pilates workout. Instead of only using the footbar as resistance, the ropes offer multi-directional resistance to engage core stabilization. The ropes also provide a secondary source of feedback for the user to ensure proper technique. What Is a Pilates Rebounder? The Pilates rebounder is an accessory that can be attached onto the reformer to allow for the inclusion of rebounding exercises during your Pilates routine. Rebounding is a high intensity cardiovascular workout that uses a mini trampoline called the rebounder. To install the rebounder, simply detach the footbar and replace it with the rebounder. Using the rebounder to introduce aerobic exercise is easy on the joints, because you're lying down to perform the movements. It not only makes for a comprehensive whole body workout, but it also combines both cardio- and strength-based training in one single routine. With the rising popularity of Pilates, more options have become available for those who want to complete their workouts at home. Home Pilates machines, like the AeroPilates Pro 556 or 557, are just as feature-rich as studio reformers, so the advantages and disadvantages of Pilates at home or at the studio are based on your personal preferences. At home, the biggest benefit is freedom. Granted that you've already learned the basics and are confident leading your own Pilates routine in a safe manner, the convenience of not having to leave the house is one of the biggest benefits. Especially if you live in a region with varying climates, you'll no longer have to skip a Pilates class because it's snowing outside. You're also in full control of your workout schedule, so you are able to maintain consistency without having to worry about when your local studio is running their classes. Furthermore, if you've decided to invest in a home Pilates machine, it will likely cost you less in the long run than going into the studio. Studio Pilates also has its advantages. In a class setting, you are surrounded by like-minded peers who are all under the guidance of a certified Pilates instructor. Even if you are no longer a beginner, the presence of an instructor can motivate you to push just that little bit harder during your workouts. It can also be an enjoyable experience for some people to feel like they're a part of a community or even make new friends at Pilates class. The AeroPilates Pro 556 is a premium home Pilates machine that is suitable for most people who are already familiar with Pilates. This is a non-folding Pilates reformer made of steel and an oak wood trim. The carriage is elevated off the floor by 15 inches and it measures 97" L x 23.25" W x 15"H. The apparatus itself weighs 133 lbs and can support up to 300 lbs. With 67 inches of rail travel, this reformer has a longer platform than most to accommodate taller users. The footbar is padded, removable, and adjustable to three different positions. The headrest is also padded and can be adjusted to three different positions. The shoulder blocks are made of high density foam. The Pro 556 is equipped with four elastic bungee cords, all of which are adjustable to varying degrees of resistance. This model also comes with a Pilates rebounder (14"x14") that can easily be switched out with the footbar for additional cardio-based exercises. 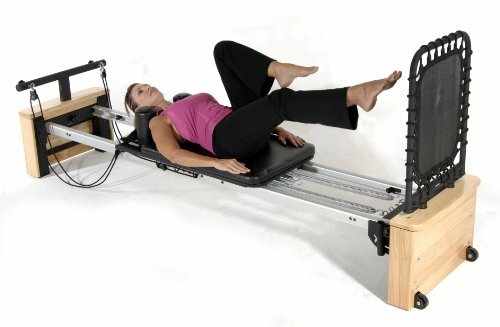 The AeroPilates Pro 557 is a similar home Pilates machine to the Pro 556, but caters to more advanced users. 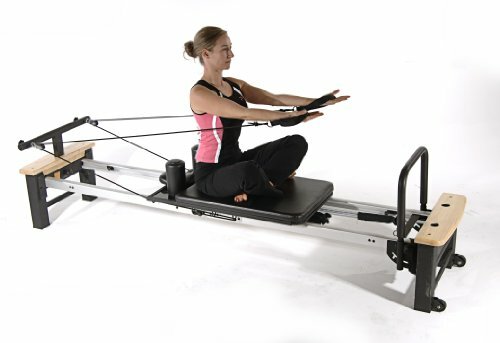 The Pro 557 is the longest Pilates reformer from Stamina, with 69 inches of aluminum rail for even longer carriage travel. This model is also made of steel and an oak wood trim. Due to the longer tracks, it measures 100.5" L x 23.25" W x 15" H and weighs 133 lbs. Similar to the Pro 556, the Pro 557 can support a user up to 300 lbs. The footbar, headrest, and shoulder blocks are also the same in both models, except the footbar is higher to accommodate taller users. Instead of bungee cord, the Pro 557 is fitted with a set of four variable springs. The spring system allows for a more precise adjustment in resistance and is more suitable for complex movements. A larger Pilates rebounder (14"x19") is included in this model. As you can see, both the AeroPilates Pro XP 556 and 557 models offer top-notch features that make it easy for you to take your Pilates workouts home with you. If you're trying to decide between the two home Pilates machines, your best bet is the less expensive Pro 556. It offers almost the same features as the Pro 557, so unless you know you'll need the marginally more advanced components because of your height or skill level, the Pro 556 is more than likely to meet your needs.